With the city of Pittsburgh still reeling from Saturday morning's rampage shooting at the Tree of Life Congregation in the city's largest historically Jewish neighborhood, Squirrel Hill - an attack that the Anti-Defamation League described as the "deadliest attack on the Jewish community in the history of the US" - Dr. Karl Williams, chief medical examiner of Allegheny County, has released the names of the 11 victims, who range in age from 54 to 97. Two middle-aged brothers, an elderly husband and wife, and a grandmother nearing 100 were among the victims. and Irving Younger, 69, of Mt. Washington. The 11 victims were killed when shooter Robert Bowers, 46, stormed into the synagogue and opened fire during a bris ceremony being held before regular Shabbat services. Six others - including two police officers and two SWAT team members who responded to the shooting - were also shot by Bowers. Bowers, who expressed anti-Semitic views on social media before embarking on his rampage, armed with an AR-15 and three Glock handguns, has been charged with 29 federal counts, including hate crimes, according to USA Today. Mourners gathered for an inter-faith candle light vigil a few blocks from the shooting in Squirrel Hill. In addition to Tree of Life, the building that Bowers targeted was home to two other congregations, all of which were conducting Sabbath services when the attack began just before 10 am. Bowers was charged with 11 state counts of criminal homicide, six counts of aggravated assault and 13 counts of ethnic intimidation...Bowers was also charged in a 29-count federal criminal complaint that included counts of obstructing the free exercise of religious beliefs resulting in death - a federal hate crime - and using a firearm to commit murder. US Attorney General Jeff Sessions said the charges "could lead to the death penalty." According to a federal affidavit, Bowers shouted at police as he was being subdued and taken into custody that he wanted "all Jews must die" and also that Jews "were committing genocide to his people." Mayor Bill Peduto called it the "darkest day of Pittsburgh’s history." As of 8:45 a.m., a 61-year-old woman is in stable condition; a 70-year-old man is in critical condition; a 55-year-old male police officer is in stable condition; and a 40-year-old male officer is in critical condition at UPMC Presbyterian. At UPMC Mercy, a 27-year-old male officer is in stable condition. Another male officer has already been released, UPMC said. Per the AP, citing court documents, Bowers shot one of the two responding officers in the hand, while the other was struck by "shrapnel and broken glass." Bowers then shot two SWAT team members "multiple times" during a shootout on the third floor of the synagogue after he had barricaded himself inside. A tactical team found Bowers on the third floor, where he shot two officers multiple times, an affidavit said. During the week, anyone trying to enter the Tree of Life synagogue needed to ring a doorbell and be granted entry by staff as the front door was kept locked. But on Saturday the building was open for worship. Michael Eisenberg, a past president of the Tree of Life congregation, said the synagogue had not received any threats that he knew of before the shooting. However, he said that the synagogue had been working to improve security, adding that it was "a concern." Details about the lives of some of the victims had started to trickle out by midday on Sunday. 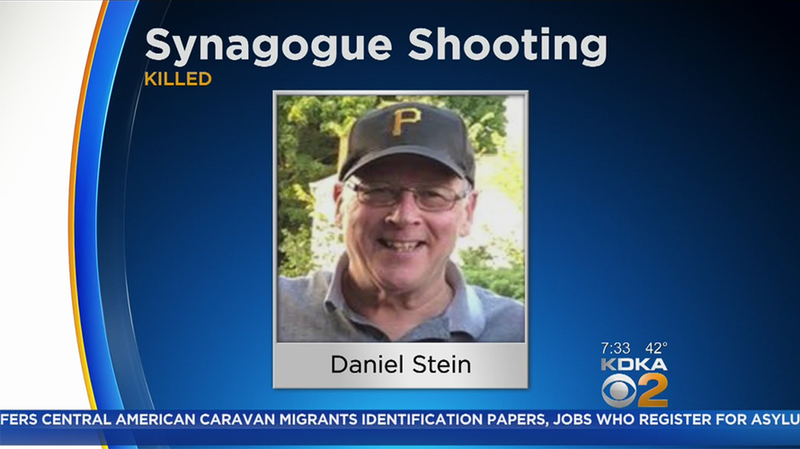 Daniel Stein, 71, was described as a kind, family man and a new grandfather, according to CBS Pittsburgh. Another, Jerry Rabinowitz, served as a personal physician for former Deputy District Attorney Law Claus for over 30 years. Law released a statement to media this morning. "Dr. Jerry Rabinowitz was more than just a physician for me and my family; for over three decades he was truly a trusted confidant and healer who could always be counted upon to provide sage advice whenever he was consulted on medical matters, usually providing that advice with a touch of genuine humor...he had a truly uplifting demeanor, and as a practicing physician he was among the very best." According to USA Today, brothers Cecil and David Rosenthal were long-time members of the Tree of Life synagogue. The two were reportedly developmentally disabled and lived together. Those who knew him said Cecil loved to greet people at the door of the synagogue before services "not out of obligation, but out of joy." We will add more details about the victims as they emerge. Bowers is expected to be arraigned on Monday. It's unclear whether he has legal representation. President Trump, meanwhile, has said he is planning to visit Pittsburgh, but didn't specify a time. The president ordered flags to be flown at half-mast on Sunday in respect for the victims.